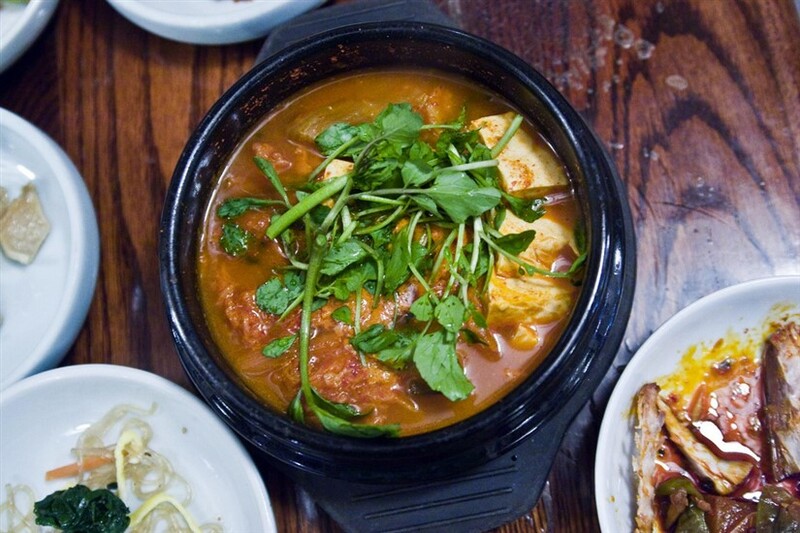 One of the most popular dishes in Korea, Kimchi-jjigae is an all-time favourite ofall Korean households. Kimchi-jjigae is usually made with leftover or aged Kimchi which gives it a strong flavour than jjigae made with fresh Kimchi. 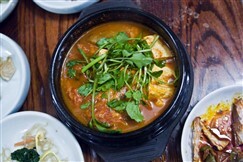 Other ingredients used in the stew arescallions, onions, pork or beef or tuna, garlic, gochujang, gochujaru, soysauce, tofu. The most important ingredient in Kimchi-jjigae is Kimchi and all other ingredientsaccording to personal desires. When using beef, it is better to use tenderloinor other soft cuts. If not available, simmer the stew for longer to soften thebeef. Increase the amount of tofu and cut out meat to make a vegetarianKimchi-jjigae. 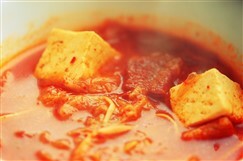 Some chefs like to add unsalted butter to the jjigae just beforeserve to enrich the stew. It is a spicy stew and perfect for cold days though Koreans eat it all year round.Reduce or increase the gochujaru according to your preference. It is communally from the middle of the table and is served with several sidedishes and rice. 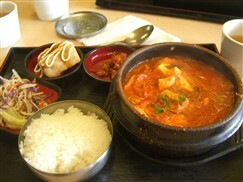 Kimchi jjigae is very good, and a nice cheap lunch, but I prefer the more complex flavors in other stews. Also, the kimchi jjigae served with bbq is usually pretty bland (which is odd, considering it's KIMCHI).